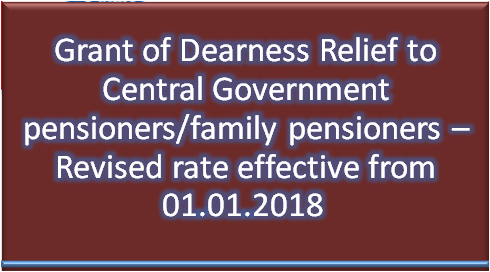 Sub: Grant of Dearness Relief to Central Government pensioners/family pensioners – Revised rate effective from 01.01.2018. The undersigned is directed to refer to this Department’s OM No. 42/15/2016-P&PW(G) dated 28.09.2017 on the subject mentioned above and to state that the President is pleased to decide that the Dearness Relief admissible to Central Government pensioners/family pensioners shall be enhanced from the existing rate of 5% to 7% w.e.f 01.01.2018. 2. These rates of DR will be applicable to (i) Civilian Central Government Pensioners/Family Pensioners including Central Govt. absorbee pensioners in PSU/Autonomous Bodies in respect of whom orders have been issued vide this Department’s OM No.4/34/2002-P&PW(D) Vol.II dated 23.06.2017 for restoration of full pension after expiry of commutation period of 15 years (ii) The Armed Forces Pensioners, Civilian Pensioners paid out of the Defence Service Estimates, (iii) All India Service Pensioners (iv) Railway Pensioners/family pensioners (v) Pensioners who are in receipt of provisional pension (vi) The Burma Civilian pensioners/family pensioners and pensioners/families of displaced Government Pensioners from Burma/ Pakistan, in respect of whom orders have been issued vide this Department’s OM No.23/3/2008-P&PW(B) dated 11.09.2017. 3. These orders shall not be applicable on CPF beneficiaries, their widows and eligible children who are in receipt of ex-gratia payment in terms of this Department’s OM No.45/52/97-P&PW(E) dated 16.12.1997 and revised vide this Department’s OM 1/10/2012-P&PW(E) dtd 27.06.2013. Separate orders will be issued in respect of above category. 4. The payment of Dearness Relief involving a fraction of a rupee shall be rounded off to the next higher rupee. 5. The payment of arrears of Dearness Relief shall not be made before the date of disbursement of pension/family pension of March, 2018. 6. Other provisions governing grant of DR in respect of employed family pensioners and re-employed Central Government Pensioners will be regulated in accordance with the provisions contained in this Department’s OM No. 45173/97-P&PW (G) dated 2.7.1999 as amended vide this Department’s OM No. F.No. 38/88/2008-P&PW(G) dated 9th July, 2009. The provisions relating to regulation of DR where a pensioner is in receipt of more than one pension will remain unchanged. 9. The offices of Accountant General and authorised Pension Disbursing Banks are requested to arrange payment of relief to pensioners etc. on the basis of these instructions without waiting for any further instructions from the Comptroller and Auditor General of India and the Reserve Bank of India in view of letter No. 528-TA, II/34-80-U dated 23/04/1981 of the Comptroller and Auditor General of India addressed to all Accountant Generals and Reserve Bank of India Circular No. GANB No. 2958/GA-64 (ii) (CGL)/81 dated the 21st May, 1981 addressed to State Bank of India and its subsidiaries and all Nationalised Banks. 10. In their application to the pensioners/family pensioners belonging to Indian Audit and Accounts Department, these orders issue after consultation with thc C&AG. 11. This issues in accordance with Ministry of Finance, Department of Expenditure’s OM No. 11/2018-E.U(B) dated 15th March,2018.